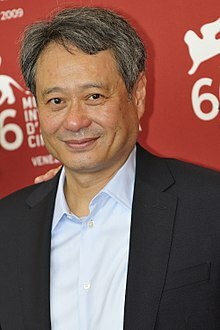 Ang Lee (born 23 October 1954) is a Taiwanese movie director. He has directed movies like Eat Drink Man Woman, Sense and Sensibility, Crouching Tiger, Hidden Dragon, Hulk and Brokeback Mountain. He has won Academy Awards (Oscars) for Brokeback Mountain and 'Life of Pi'. Ang Lee was born in 1954 in a town called Chaozhou, Pingtung in Taiwan. He went to the National Tainan First Senior High School where his father was the principal, and then to the National Arts School. He graduated in 1975. In 1979, he went to the United States and studied theater at the University of Illinois at Urbana-Champaign. He got his Master's degree at New York University, and he worked there with another famous director called Spike Lee. ↑ Ho Yi. Family and friends praise Ang Lee's quiet dedication. Taipei Times. 7 March 2006. This page was last changed on 6 November 2013, at 01:41.